Today starts a new path, snout faithful. This Christmas Eve, after 2 and a half incredible years, we will be saying goodbye to our beloved KoreaTown location. We cannot thank the BEAUTIFUL and amazing city and people of Korea Town enough, for hosting us. From the bottom of our hearts, we deeply appreciate all of you who have taken the time to come in, say hi, share some stories, and try our food! We’ll miss these times, but the snout’s definitely not out…because we’re not going out of business…we’re joining with a collective of amazing restaurants to bring you a whole new experience! We are so excited to announce that we’ll be relocating our store to bring you (our favorite people) some new and incredible menu options, more parking, and (hopefully) BEER to accompany your sisig oxtail and adobo likings! We’ve listened and read through all your feedback and we are now getting ready for Belly and Snout II! Stay tuned, as we will be posting updates along our journey. While we won’t have a brick & mortar for a few months, we will still be around, participating in a multitude of festivals, night markets and catering events. It will be an awesome few months, filled with adventures and tons of food! Thanks, once again. We hope to see you all at our new location (details coming soon!). Please feel free to keep in touch at bellynsnout@gmail.com. We’d love to hear what you all are doing! Peace, love, and good eats! Time to go downtown, to sisig town! We made it onto Food Network’s Diners, DriveIns and Dives! It was such an amazing experience; one which we’ll be sharing with you, real soon. Meanwhile, here’s a clip of the show. Make sure to check your local listings to find us! Many thanks to Food Network, Guy Fieri and the awesome crew of Citizen Pictures for the opportunity! Chef Warren (left) and Chef Aris (of Baker Cakemaker) repping LA! Memories of youth, our mutual fascinations with fear, and doing Mom & Nanay proud. These are all of the things that make Belly & Snout’s owner, Chef Warren Alemda, tick. Read on to learn more! What is the background/significance of the name? The belly & snout of a pig are the two main ingredients we use in our most popular item – Sisig. In thinking of our previous name, ‘The Discussion Truck’, I opted to refresh the name and focus more on the product. What is the inspiration behind the menu? A childhood memory of mine was eating at the American fast food chains – Mcdonalds, Denny’s, Carl’s Jr, Norms, etc. Every Sunday, my family and I would enjoy a special treat of french fries, hot dogs, and hamburgers. When creating the menu, I wanted to recreate the childhood memories of eating fast food, and incorporate my Mom’s adobo recipes and my grandmother’s kare kare. To balance out the rich and hearty flavors, I also incorporated my culinary experience at the California Culinary Academy to finish off each dish with unique garnishes (i.e pickled red onion, garlic crema, chicharron). What is your favorite dish to make and why? This is a hard question to answer. I like making every dish on the menu. I find the most joy in giving the meal to the customers and hearing their reactions, which initially are moments of excitement and surprise. Most new customers to Belly and Snout do not expect the food to look the way it is. Filipino Americans constitute the second-largest population of Asian Americans in the country, yet the cuisine has only gained popularity within the last 3 years. why do you feel it has taken so long? The awareness is slowly rising through food channels like Bizarre Foods and No Reservations. Most of the ingredients in Filipino food can be a little scary to those unfamiliar (i.e. snout, liver, ears). I honestly feel that Filipino food is the next gem cuisine, as more people become willing and able to try something out of the ordinary. Your menu is filled with hits, have there been any misses? Yes, the Chicken Adobo Hot Dog didn’t sell. We took it off the menu, because most of our customers preferred pork over chicken. What or who inspires you, in terms of cooking? My Mom and Grandmother are the inspiration for my menu. They both taught me how to make adobo and kare kare – both recipes are straight from their kitchens. You have a vast background in mutiple styles of cooking and food preparation. How have those helped you in formulating your unique blend of menu items? A lot of the menu items I do were based on memories during my childhood and the experience i gained working at different restaurants. Working (at different restaurants and my moms cooking) has helped alot in creating the menu. What can you tell the non-filipino about what they can expect from filipino cuisine? For the non-filipino, expect the five senses to be on overload. It hits every sensory gland in your brain. There is sweet, savory, salty , sour, and sarap (tasty)! Expect your tastes buds to be blown away with so much flavor. After graduating from the prestigious California Culinary Academy, Chef Warren Almeda immediately became a culinary force, working in some of the finest restaurants in America including Roy’s Hawaiian Fusion Restaurant and Roppongi. Known for his inventive dishes, Chef Almeda has cooked alongside many high-powered chefs, such as Katsuya Corporate Chef Danny Elmaleh and celebrity chef Ludo Lefebvre of Ludobites and Top Chef Masters fame. Participating in events such as the San Diego Food and Wine Festivals as well as catering for stars such as Blink 182’s Mark Hoppus, Chef Almeda continues to build his reputation as a culinary maverick with his Los Angeles based Filipino/American fusion restaurant, Belly & Snout. The concept of Filipino Fusion is nothing new to Chef Warren Almeda. In fact, it’s been in his cooking vocabulary for years. So, when the opportunity arose to start a restaurant in the culinarily-popular Koreatown LA area, Chef knew exactly what to serve. But how did it all start? Trained at the California Culinary Academy of San Francisco, Chef Warren Almeda brings 10 years of experience to the table with his unique style and Asian-inspired cuisine. Earning his degree at Le Cordon Bleu Culinary Arts, he further broadened his skills with tenures in San Francisco, San Diego, Los Angeles, and Las Vegas. For the Discussion Truck, Warren utilized his distinctive blend of Filipino flavors mixed with American classics to create a palate teaser for everyone to enjoy and “Discuss”. … and thus, Belly & Snout was born! Hard at work in the truck. The sisig won’t cook itself!!! 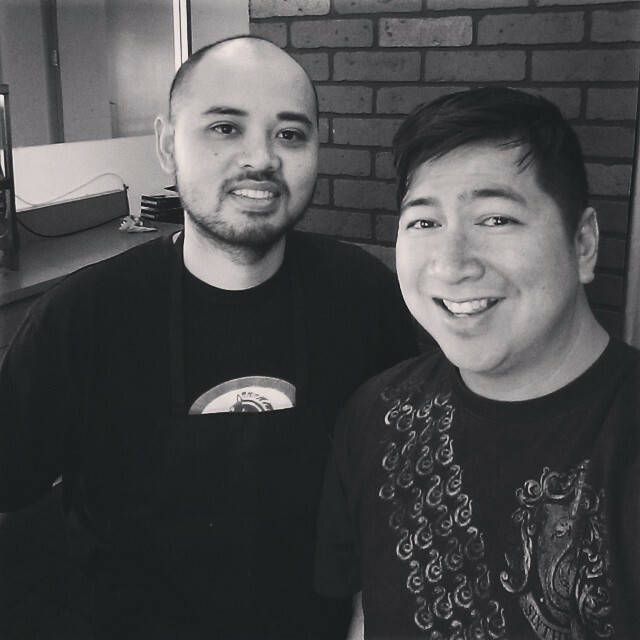 Chef Warren Almeda, with brother Bryan, taking a quick photo break before the rush. via The Discussion Truck: Lets Talk… on Vimeo.